I was looking for a new slow-cooker/crock pot recipe to try this fall, and I came across this recipe which appeared easy, full of flavor, and didn't require me to run right out and spend $40 on all the ingredients. I don't know where you all live, but here in the midwest, we've got some serious rain coming down outside. There's not a more perfect day to be holed up at home and trying out a new recipe that will warm you right up. Forgive me, Texans, for not knowing what makes this particular chili "Texas-Style," (please enlighten me if you know!). All I know is that it's YUM-TASTIC. Above I posted the original recipe, below is my version of it. I adjusted a few of the ingredients and amounts to give it a bit more flavor and make it just a wee bit more on the healthier side. Fry bacon until crisp; remove bacon with slotted spoon and drain on paper towel. Brown half the beef cubes in pan with bacon drippings, about five minutes. Place in slow cooker. Repeat with remaining meat. Stir bacon and remaining ingredients into 3 1/2 to 4-quart slow cooker. Cover and cook on LOW for about 7-8 hours or until beef is tender. Stir occasionally. Serves 6. My mom came across this one from Kraft's Food & Family magazine. Check it out! Are you drooling yet? Refrigerate at least 1 hour before serving. Makes 10 servings, 1 cup each. You can feel free to make this a bit more to your liking (say a homemade crust, alfredo sauce, spices, etc. etc. ), but since we're all about the simplicity here at Cooking With Court, you'll be able to whip up this easy meal in a matter of minutes. I love Chicken Alfredo and I love pizza; so it was natural that I decided to combine the two. You can add your favorite pizza toppings of choice. 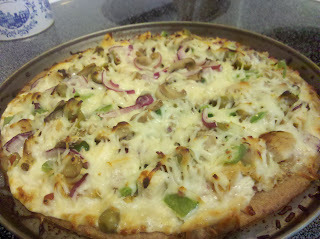 We did red onion, green pepper, green olives, and mushrooms. But here's our's. We love it, and I have to say it went really great along with NFL Football today! Obviously you can use whatever toppings you prefer. And if you do use others, please comment below and tell my readers how it was! Lightly spray bottom of pizza pan or cookie sheet to avoid sticking. Spread alfredo sauce evenly all over pizza crust. 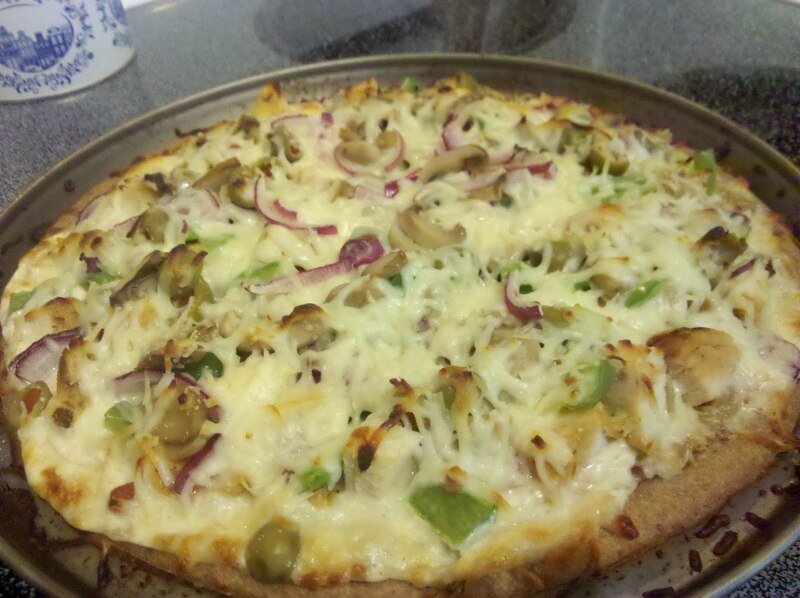 Top with chicken, onion, green pepper, mushrooms, and green olives. Top with generous portions of mozzarella cheese. Bake for 20 minutes or until cheese is golden brown. You guys are gonna LOVE this recipe. Chances are you have most, if not all of the ingredients already in your kitchen. If you're a busy bee like me and you're looking for a super cheap, RIDICULOUSLY simple, and fast recipe for dinner tonight? You've stumbled upon the right one. I had this whole thing whipped up and in the oven in less than 5 minutes. Heat oven to 400 degrees. Place chicken into 2 qt. shallow baking dish. Stir picante sauce, brown sugar and mustard in a small bowl. Pour picante sauce mixture over chicken. Bake 45 minutes or until chicken is cooked through. 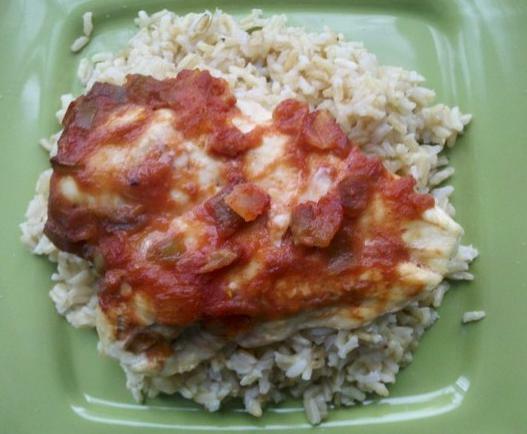 Serve chicken and sauce over rice. Given the big lover of spinach that I am (if you're a faithful blog reader, you know this well), I had to try these cute little cakes. The hubby and I were in love at first bite. Surprisingly, there was a lot of flavor and they kept us "full" for a decent time. So if you're looking for a healthy snack, check this out! Unfortunately, I could not get a decent picture with my camera, so I'm using the pic from the actual newsletter. Bake the spinach cakes until set, about 30 minutes. Let stand in the pan for 5 minutes. Loosen the edges with a knife and turn out onto a clean cutting board or large plate. Serve warm, sprinkled with more Parmesan, if desired. **THE ORIGINAL RECIPE CALLS for cakes to bake for 20 minutes...I found it to be more like 30-35. So keep an eye on your oven!